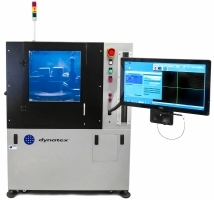 Leveraging patented technologies, Dynatex International's DTX Scribe and Break can manage the unique needs and diverse applications of customers that require a dry dicing process for die singulation and other critical applications. The DTX Scribe and Break performs high precision diamond scribe and break dry dicing for materials such as Indium Phosphide, Gallium Arsenide, Gallium Nitride, Silicon, and Borosilicate Glass, in substrate sizes up to 200 mm. Footprint Width: 57", Depth: 50", Height: 78"
Although the information and recommendations set forth herein are presented in good faith and believed to be correct, Dynatex International makes no representations as to their completeness or accuracy. Information is supplied upon the condition that the persons receiving will make their own verification and determination as to its suitability for their purposes prior to use. In no event will Dynatex International be responsible for damages of any nature whatsoever resulting from the use of or reliance upon this information. NO REPRESENTATION OR WARRANTIES, EITHER EXPRESSED OR IMPLIED, OF MERCHANTABILITY, FITNESS FOR A PARTICULAR PURPOSE OR ANY OTHER NATURE ARE MADE HEREUNDER WITH RESPECT TO INFORMATION OR PRODUCT TO WHICH INFORMATION REFERS. The DTX Scribe and Break excels in dry dicing of high value and high volume devices, which produces quality die, high device yield, and lowers the overall costs of the die singulation process. I was looking for a high quality scribing/breaking machine to cleave quantum cascade laser wafers into laser chips. I had a limited budget. The Dynatex team closely worked with me to fully understand the technical requirements for my laser fabrication processes. At the end, they offered me a refurbished system configuration within my budget that fully met my technical requirement. The system was pre-configured for wafer and chip dimensions that we had specified: a truly turn-key solution. We have been easily achieving mirror-like quality for laser facets with almost a 100% yield for the chip singulation. In addition, all our questions and concerns have been immediately addressed and we have never felt that we had to deal with technical problems alone. It is truly a pleasure to work with the Dynatex team and I strongly recommend their products to prospective buyers needing semiconductor wafer dicing equipment and/or services. Call 707-542-4227 or send us a message below. Copyright © 2016 - 2019 Dynatex International, all rights reserved.